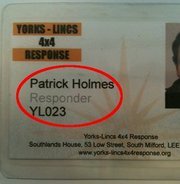 Every YR4x4R responder should have an ID card (see example on to the right of this text, responder name and number are circled in red) that can be verified by this system, this should clearly state their name and their responder number (this will be in the format YR000). You can use the below search function to search for current members of Yorkshire 4x4 Response. You can search either by a name or by a responder number. Click 'View Profile' in the 'Responder Info' column to view the members profile that you are looking for, this profile will confirm if the member is a YR4x4R responder.